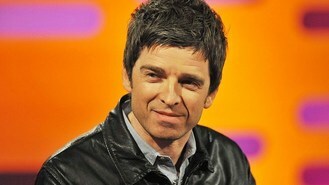 Noel Gallagher is set to play with Coldplay's Chris Martin at the Brit Awards, host James Corden has suggested. Funnyman James, returning for his third presenting stint at the bash later this month, said Chris was being lined up to accompany the former Oasis star. He let slip during an interview with Radio 2's Jo Whiley Show. Speaking about Noel's performance, James said: "I think Chris Martin is going to accompany him on the piano." He added: "I just think that would be amazing." James pointed out that it was supposed to be kept under wraps. "I'm not supposed to tell you this but this might have been announced, I don't really care," the Gavin & Stacey star said. He revealed Blur - who are reuniting to collect an outstanding contribution at the event on February 21 - are rehearsing an 11-minute set. And James, who is taking his hit West End show One Man, Two Guv'nors to Broadway said he is writing a new TV show, The Wrong Mans, with actor Mathew Baynton. Mathew has appeared in award-winning children's TV series Horrible Histories, as well as playing Deano in Gavin & Stacey. "And so me and him are writing it, and it's like a thriller comedy - and we're writing it now so who knows how it will evolve," James added. British rapper MIA is rumoured to have split from her fiance. Jessie J has insisted she is going to "chill" when it comes to making her second album. Ronnie Wood has revealed he turned down a chance to join Led Zeppelin. One Direction's Harry Styles has taken up Pilates to sort out his posture. Sir Mick Jagger is due to return to the top 10 of the singles chart for the first time in more than a quarter of a century. Sir Paul McCartney will headline a spectacular musical tribute to the Queen to mark her Diamond Jubilee. Cher Lloyd has revealed she's cried herself to sleep over internet bullies. Madonna has announced details of her next tour - which will kick off in Israel. Sir Paul McCartney is set to play at the official concert to mark the Queen's Diamond Jubilee, it has been reported.